How Obama's policy shift will and won't affect technology in Cuba. 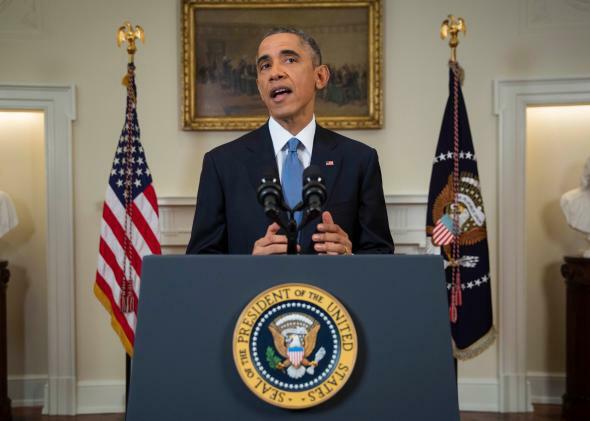 President Barack Obama speaks to the nation about normalizing diplomatic relations the Cuba on Dec. 17, 2014. A version of this article first appeared on Global Voices Advocacy. Wednesday’s bombshell announcement that the U.S. and Cuban governments have decided to re-establish diplomatic ties after 56 years of estrangement brought tears, joy, awe, and disbelief to Cubans across the globe. (And some anger from Cuban-Americans, too.) While President Obama’s speech was watchable in real time—televised and streamed live on the White House website—those outside of Cuba had to wait patiently for the text of Raul Castro’s speech to be transcribed and uploaded to Cuban state media sites. The brief address delivered by Cuba’s commander-in-chief was not streamed live because Cuba’s rickety Internet infrastructure cannot support it. At least not yet. Among thousands of other questions flying around the Internet and the streets of Miami, Havana, and Washington today is the question of technology. What will these changes mean for Internet access and mobile telephony in Cuba? For now, little is certain. But there are a few things we can glean from what both leaders have said—and haven’t said—so far. While Western advocates may rush to focus on how this will affect government policy and practice around the Internet, like surveillance and censorship, the impact of yesterday’s economic reforms on the tech environment in Cuba may be the most critical change to watch at the moment. With more money, more Cubans will be buy mobile phones and service. This does not mean that they will have Internet access—3G is scarce at best on the island. But it will accelerate the changes that are already taking in place in Cuba due to peoples’ increasing ability to connect with one another through mobile telephony. More than ever, news and information that once traveled only by word of mouth will now circulate more quickly and in greater volume. And Cubans’ ability to communicate with friends and family abroad will likely increase, too. We can also anticipate an influx of tech objects and hardware on the island—computers, mobile phones, hard drives, pen drives are all in high demand in Cuba and they are not easy to come across. The changes will without question make it easier for Cubans to obtain tech objects that will in turn enable greater communication and information sharing on the island. And greater access to capital will also enable more Cubans to get online at hotel business centers and Internet cafes, where rates (ranging from USD $4.50 to $12.00 per hour) are out of reach for most of the population. This will increase not only the number of Cubans who use the Internet themselves, but also the quantity and diversity of digital media in circulation on the island. Videos, music, news, and literature regularly circulate secondhand via pen drive, mobile phone apps and other lightweight mechanisms for data storage—a person with Internet access downloads a video, puts it on a pen drive, and circulates it hand-to-hand among friends who watch the video, copy it, and distribute it to more friends. The importance of these second-hand networks, what Cuban blogger Orlando Luis Pardo once termed Cuba’s “Internet offline,” must not be overlooked. I’ve authorized increased telecommunications connections between the United States and Cuba. Businesses will be able to sell goods that enable Cubans to communicate with the United States and other countries. This promising but vague assertion raises a lot of questions—what kinds of businesses is he talking about? What kinds of goods? In recent years, telecommunications companies like Verizon and AT&T have pushed to loosen restrictions on their industries in an effort to enter negotiations with the Cuban government. And they have made progress since Obama came into office. But this is only one of two hurdles. The second is the Cuban government, which like, every country, imposes requirements and restrictions on foreign businesses that wish to establish themselves on their soil. So plenty remains uncertain. Obama cannot unilaterally dismantle all U.S. government policies limiting contact and commerce with Cuba—as both leaders noted, the embargo is codified in legislation that only Congress can change. And although Obama advocated for leaders on both sides to move forward and leave behind their respective legacies of “colonialism and communism” it is not clear how this will play out in practice. Old habits die hard—and trust is no easier to build in the digital era than it was in 1961.